Another month, another awful Sephora Play box has arrived. 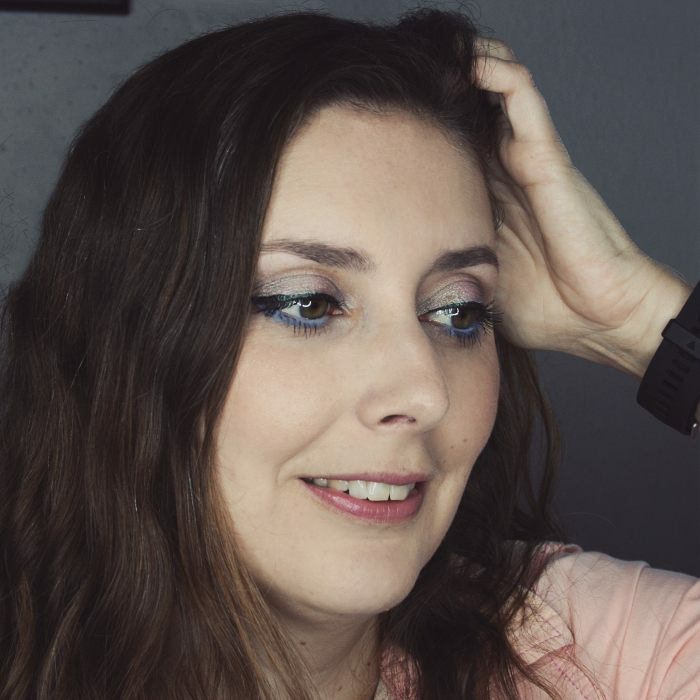 2018 has been a terrible year so far for this popular monthly beauty subscription box, and March was no exception. It was so bad that I'm not even trying to pretend to get you excited... 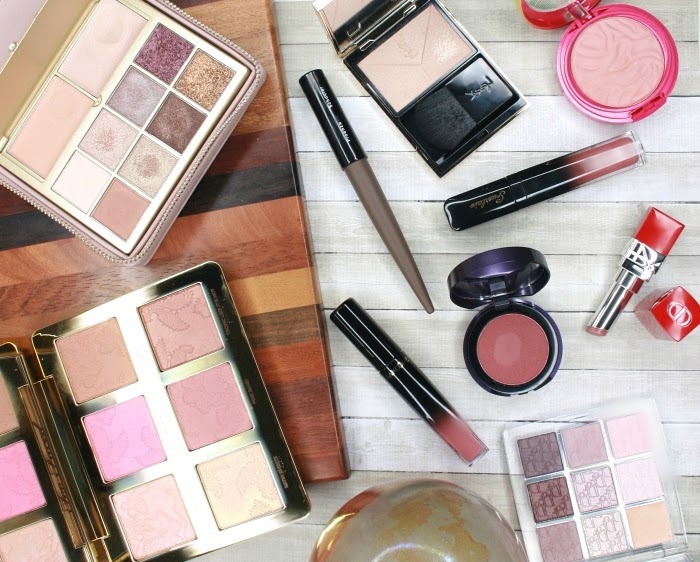 If you want to see the train wreck that Sephora Play has become, keep reading! 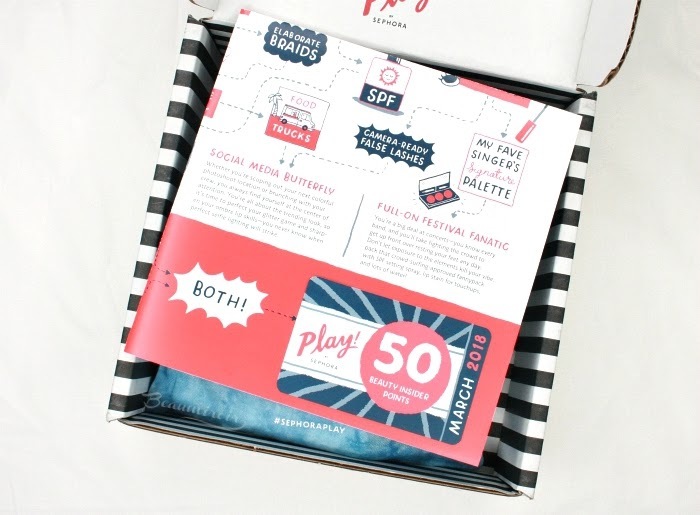 If you want more info about how the Sephora Play subscription works, take a look at one of my older posts, like this one. In a few words: the subscription costs $10 a month plus tax, and there are 6 beauty products in each box (one is supposed to be a "bonus", whatever that's supposed to mean). The theme this month is "festival beauty". That would have been enough to make me roll my eyes, even if the contents of the box had been good. "Festival season" is a made up concept, centered around the Coachella music festival taking place in the California desert, that the beauty industry has been using as an excuse to launch childish makeup collections full of body stickers and glitter. See the Too Faced Life Is A Festival or Tarte Mermaid collections this year. It's a bit like the "resort collection" for fashion: referencing a lifestyle that 99.9% of a brand's customers do not have access to - do you know how much tickets to Coachella sell for? Worse, the "festival trend" is rife with appropriation of Native American culture, such as chicks wearing feather headdresses because "they look so cool". 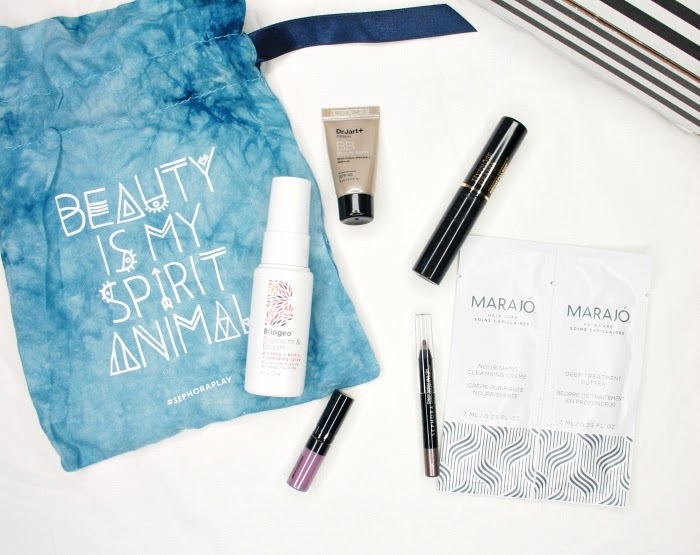 I'm shocked to see that Sephora did their part to perpetuate this disturbing behavior with the print on this month's drawstring bag: "Beauty is my spirit animal". Not okay. - Lancôme Hypnôse Drama Mascara. Sigh. This is not a bad mascara, but it's been around for ages. Probably decades? 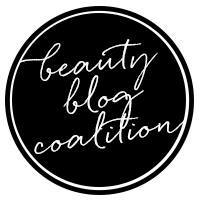 So anyone interested enough in beauty to subscribe to a monthly box service has very likely already tried it. It's definitely not my personal favorite among Lancôme mascaras. In fact, the brand just released the waterproof version of their newest one, Monsieur Big. Why didn't we get that? 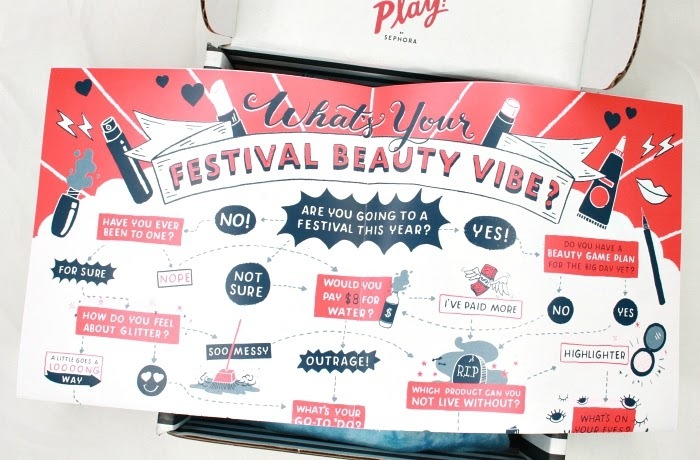 It's brand new - and let's not forget that the Sephora Play box was supposed to be an opportunity to try new products - and the waterproof, longwearing formula would have been a better fit for the festival theme. You know, a waterproof mascara wearing through a night of dancing kind of idea. But nope, we got the old deluxe sample of Hypnôse they've probably had in stock for years. - Sephora Collection Cream Lip Stain in Bohemian Purple. Oh look, they chose this one for the shade name. I've said it again and again, if Sephora is going to include their own brand in their boxes, they should REALLY make the products full size. This one is a tiny sample, and the shade looks plain ugly. 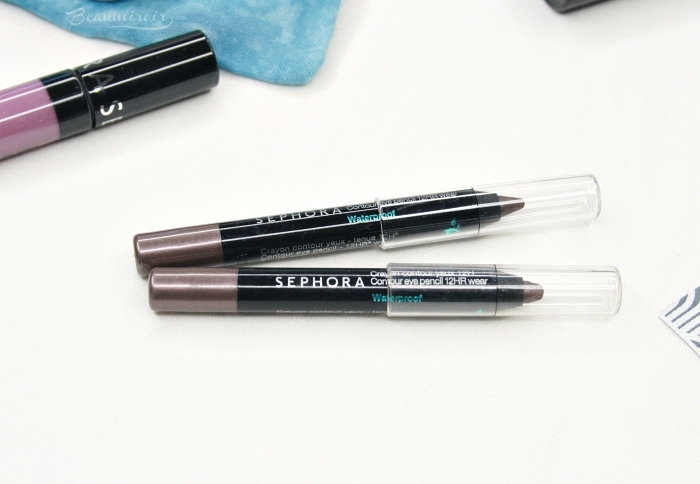 - Sephora Collection Contour Eye Pencil in Flirting Game. WHAT? Are you kidding me Sephora? We get TWO minis of YOUR OWN BRAND in a subscription box that we PAY FOR?? And now the worst part: I have already received this exact mini pencil in the exact SAME SHADE in my Play box for August 2016!! It's been less than 2 years! Did you think I forgot Sephora? There are TWENTY-FIVE shades of this eye pencil available and you send me the same twice? Are you actively trying to make me angry or are you just plain stupid??? Oh wait, did you just have extra stock of these mini pencils from two years ago and had to get rid of them before they officially expire? I guess that's the most likely explanation! The new pencil, and the one from 2016. I don't even like this shade so I never use it. - Dr Jart+ Premium Beauty Balm. I'm not into BB creams, but this is the one sample in this box that is not making me foam at the mouth in anger so I guess it's a decent one. The shade is a terrible match for me though: I got 01 Light-Medium and it's literally pink. I have warm undertones - as Sephora knows because they have my Color IQ saved in my profile - so I'm not even going to try it on. - Marajo Hair Care packets. Yay, packets of shampoo and conditioner like the ones you get in magazines! This has to be the worst Sephora Play box I have ever received. Two Sephora brand products including a repeat in the exact same shade, old products I first tried years ago, and brands I'm sick of. I'm really tempted to cancel my subscription, and I know I'm not the only one. The Sephora Play has been going downhill at supersonic speed in 2018 and it's really concerning. I wouldn't be surprised if Sephora stopped the subscription in the next few months, considering they've been putting no effort in creating exciting boxes since the beginning of the year. Maybe the service didn't drive more sales the way they were expecting? I don't know what the reason is, but I really feel like Sephora has already given up on it. I'm going to wait a couple more months to see if the trend of outrageously bad boxes not worth $10 is confirmed. But if it hasn't improved by the beginning of summer, I'll be done with it. The subscription featured in this post is purchased by me. I received no compensation to write this post, which only reflects my personal opinion. This post contains affiliate links. I receive a very small commission when you click on those links, and the money generated covers a small portion of my expenses to purchase products for review. Clicking on those links helps ensure that Beaumiroir continues to publish reviews of new and exciting high end French products - at no cost to you!